Eddie Redmayne demonstrates a Magic Colouring Book on The Graham Norton Show. So while working on a new package which I'm putting together, I bought more of them than I would normally. I put them on ebay for possible sales and thought no more about it. "I ordered more due to putting a box of children's tricks together." These packages are aimed at adults performing a routine for children, thus saving the need to hire children's magician for parties. The whole package and tuition videos will be around £60 and include six great magic tricks to put together a 20-minute routine which can use again and again. I have specially picked magic tricks that are easily handled, but very visual and colourful. The bottom line is that I checked my email for ebay sales last night, as we always get quite a few over the weekend, and almost all of the extra Magic Colouring Books I'd purchased had been sold! I put out a facebook message asking why this may have been so and a friend replied immediately with the news that someone had performed the Magic Colouring Book on the Graham Norton Show, so there you have it, the power of TV. "I suppose I shall now have to advertise them 'As Seen On The Graham Norton Show'." In fact I shall start now: "LADIES AND GENTLEMEN, GET YOUR MAGIC COLOURING BOOKS DIRECTLY FROM ME". 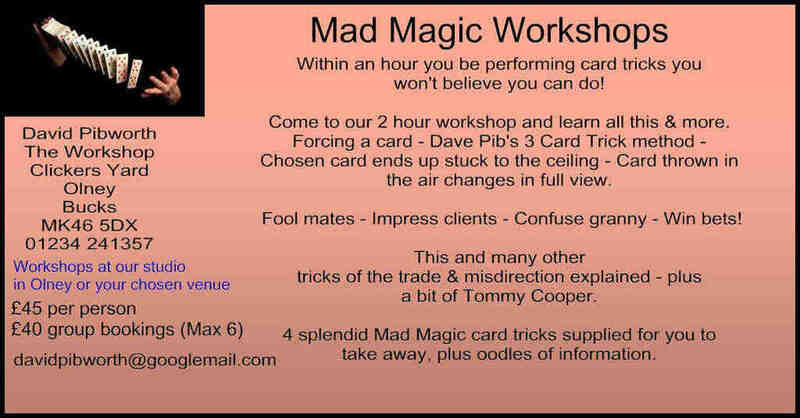 Or the whole children's magic package if you fancy doing a bit yourself. You'd be amazed how many children suddenly think you're quite cool if you can make a light appear from their ear or have a silk hanky disappear, all of which are included in the package. Call me on 01234 241357 or click here to send me an email enquiry and I'll be in touch as soon as I can.